15 minutes play...BumbleBeans Inc.: LuAnn's finish! A friend whom I met at the Alabama Folk School over a year ago, Luann, sent me an email with pictures of her first COMPLETE quilt. Way to go LuAnn! Now don't look too close, but, I wanted to show you my first completely finished quilt! 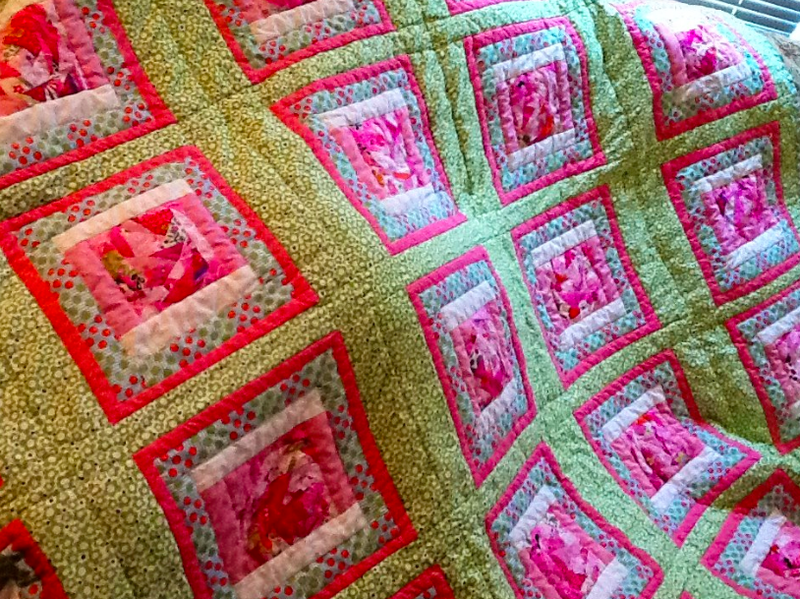 Machine quilted on my Juki! All straight lines (somewhat), of course, but I hand stitched the binding! After I got home from my time at quilt camp, I bought a TON of scraps from a girl I met that makes these cooling bandanas. All 100% cotton, but mainly all cut into many sized (as in small) triangles! 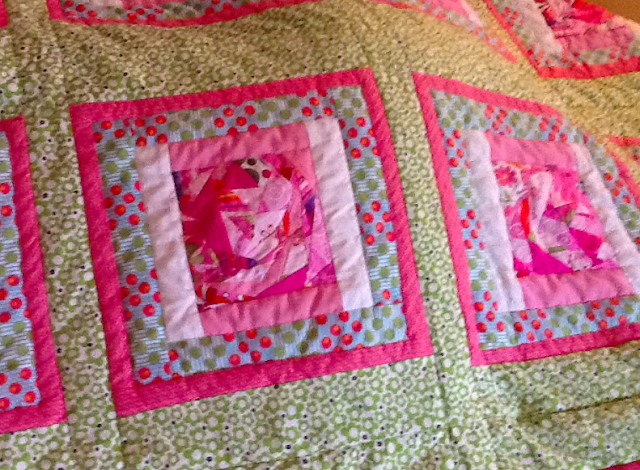 The center squares of this quilt are made from a variety of pinks, but, mainly one particular print of breast cancer logos! So, I found a way to camo the breast cancer print and still use it! 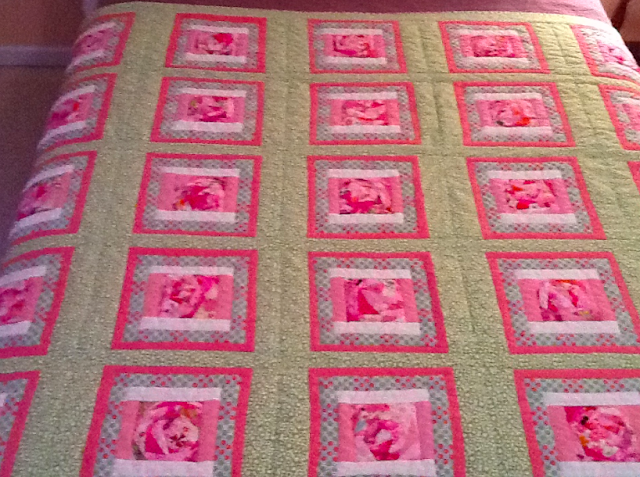 Fantastic First quilt, I'm impressed! Very very nice! Its a beautiful quilt! Wonderful! I love the colors!! Love your pink posy-like centers and the overall effect. Looks like a well-tended garden. she should be very proud of herself for a great quilt! That is fantastic!! She did a great job and kept at it - all because of your insperation!! Love it!! That is something to be proud of! Kinda looks like flower petals in the center blks, perfect! Fabulous! Yes, the scrap blocks look so much like lush blooms. Thanks for sharing! LuAnn should be very proud because it's gorgeous! I'm so very glad I stopped here today. Way to go LuAnn! It's very good, and your first, that is special.